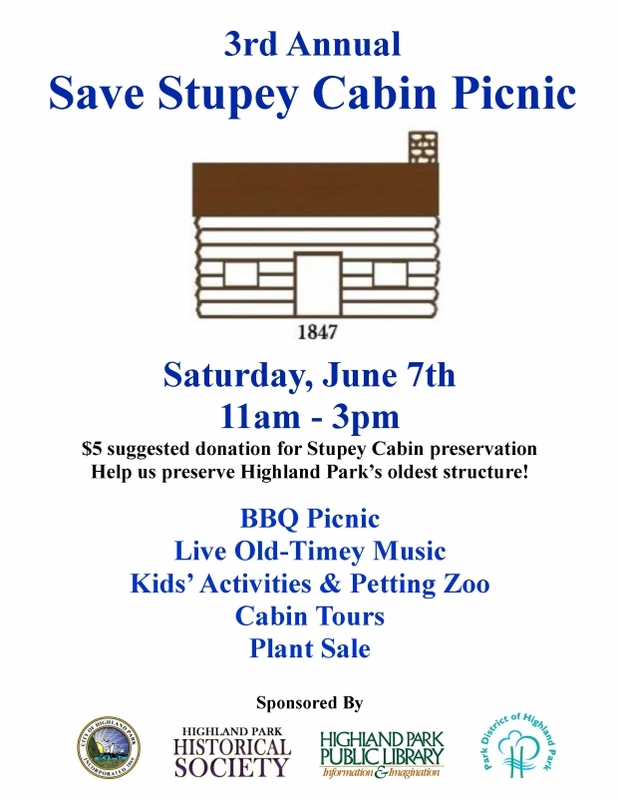 Highland Park, IL – May 19, 2014 – The Highland Park Historical Society invites the community celebrate our pioneer history and step back in time on June 7, 2014 from 11:00am – 2:00pm for the Third Annual Stupey Cabin Picnic and Fundraiser. The 3rd Annual Picnic will include live music, BBQ lunch and tours of the Stupey Cabin. Children’s activities will include a petting zoo and pony rides, arts & crafts and traditional craft demonstrations. The picnic will take place at the Stupey Cabin, located between the Highland Park Library and City Hall on St. Johns Avenue, across from the Highland Park main train station. The 1847 Stupey Cabin was built by the family of Prussian immigrant Frances Stupey and is the oldest standing structure in Highland Park. The cabin is owned and maintained by the Historical Society. It moved to its current site in 1968 when the Exmoor Country Club donated the cabin to the people of Highland Park. The cabin is in need of significant preservation work to ensure the cabin’s existence for future generations. According to Historical Society President, Rob Rotering, “The picnic is both a fundraiser for preservation of the Stupey Cabin and a celebration of our town’s pioneer roots, in partnership with the City of Highland Park, the Park District and the Library.” While all of the events are free of charge, food is available for purchase and a donation to ‘Save the Stupey Cabin’ is kindly requested. During the picnic, the Loopy Ladies will demonstrate the pioneer art of rug hooking. In addition, there will be presentations from the Park District of Highland Park Heller Nature Center on both beekeeping and composting. The DuPage Valley Settlers will stroll the grounds dressed in period costumes and the Midwest Fiber & Folk Fair will provide information about traditional local craft events and guilds. Gardeners will also have the opportunity to purchase organic and heirloom plants. All events will take place in front of the Francis Stupey Cabin located in Laurel Park, on St. Johns Avenue between the Highland Park Library and City Hall. Parking is available in the City Hall public parking lot and the city parking structure at St. Johns and Laurel Street. The Metra Union Pacific North stop is “Highland Park,” located across St. Johns Avenue from the event. No rain date is planned. The Highland Park Historical Society’s mission is to preserve, teach and make accessible to the public, the history of Highland Park. For more information, you are invited to visit the museum Wed.–Fri. 14 and Sunday 24. [email protected]. Find out more about our organization and events at www.highlandparkhistory.com, and visit us on Facebook under Highland Park Historical Society.